Perform an Interchange Modification Study (IMS) to reconstruct the interchange at KY 3076 (Mineola Pike) to improve congestion and support economic development. Provide pedestrian facilities across I-275. 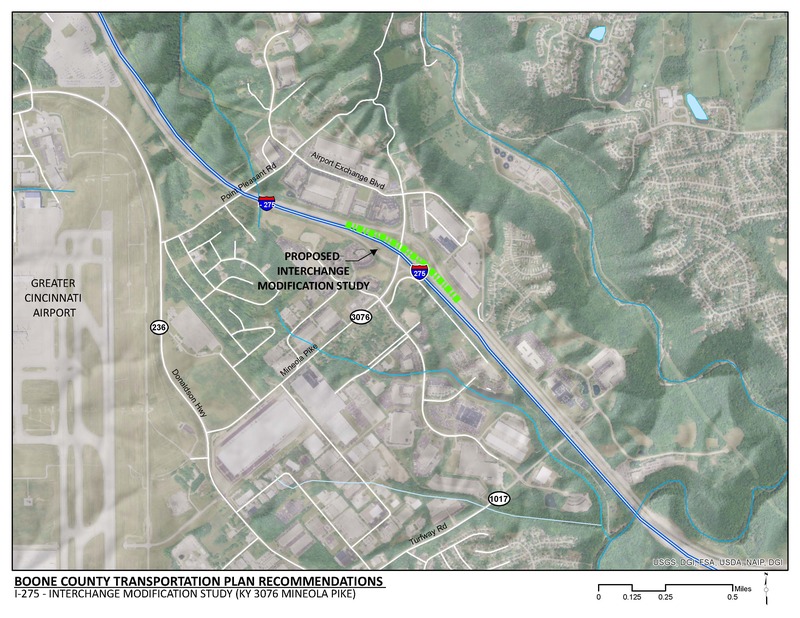 Improved capacity at the I-275 interchange with KY 3076 (Mineola Pike) will improve existing congestion, as well as support traffic generated from expansion of development within and east of the Cincinnati/Northern Kentucky International Airport (CVG). The project creates a pedestrian connection across I-275. The pedestrian facilities proposed are consistent with Boone County’s overall goal of improved bicycle and pedestrian connectivity and safety. Click HERE for a map of multi-use paths in Boone County. Currently, the heaviest movement of vehicles is from I-275 to the development along Airport Exchange Boulevard which includes a mix of industrial land uses and hotels. Freight distribution activities at CVG and along Airport Exchange Boulevard is expected to grow dramatically which will significantly increase the volume of truck and employee traffic through the interchange. As development continues to expand in and around CVG, it is essential to provide reliable mobility to serve these facilities. In addition to the expanded distribution development at CVG, employment within the area is expected to increase by over 1,500 jobs by 2040. The crash rate along KY 3076 at the I-275 interchange is almost 90 percent higher than the average crash rate on similar roadways. TANK fixed route 2X serves CVG and the development to the east of the airport. The I-275 interchange with KY 3076 is an essential component of this route.